← Should You Season Your New Yixing Teapot? Are You Feeling That Qingming Tingle? The sight of the photo below from a Chinese news source recently signaled that Qing Ming time was here. And that means the pre-Qingming teas were ready and the post-Qingming teas were in process. That process, of course, starts with the harvest. And the very thought can set some tea aficionados to tingling with anticipation! Qing Ming is a Chinese festival. It is also the first of four key dates indicating important separations of Spring (April-May) tea harvesting and production. The first key harvest time is called “pre-Qingming” and goes from around mid-March to Qing Ming (around April 5th or 6th). The second key harvest time is called Yu Qian (“Before the Rains” or “Great Rain”) and starts after Qing Ming, going for about two weeks to April 19th or 20th. The third key harvest time is for Gu Yu (the true Spring teas), starting the last week of April and going until about May 6th. The fourth and last key harvest time is called Li Xia (Late Spring) and goes from May 6th to May 21st. Unlike many teas from other tea growing countries where there are 3 or 4 flushes per year (periods of growth and then harvesting), Chinese teas are harvested multiple times and vary depending on the location and topography. 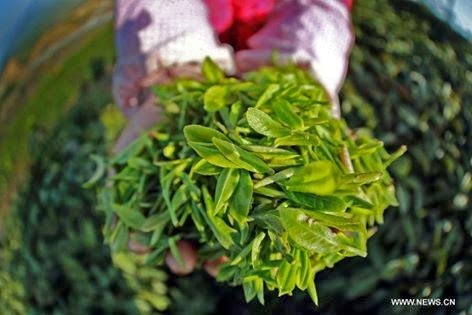 April is certainly the busiest time for harvesting premium green teas from several of the eastern provinces of China. Fuding produces the best Bai Hao Yinzhen (Silver Needle) with the top quality being harvested pre-Qingming (fat, strong buds with a silvery white tone and downy hairs versus those picked later in the tea season which are flatter with a grayish color). Jiangxi produces Lu Shan and Ming Mei. Sichaun produces Gan Lu. Zhejiang is the source for the best Longjing (Dragonwell), Long Ding, and more; in fact, the best Longjing grade is said to be the certified pre-Qingming version from the West Lake Region of the province and is made from the most tender first shoots after dormancy. Guizhou is the source of a special tea called Leigongshan Silver Ball, grown on Thunder Mountain, a nature reserve with a moist climate and fertile soil; it uses leaves harvested pre-Qingming and that are only a bud with a maximum length of 2.0 centimeters. Some other teas of high reputation produced during this time: Fenghuang Dancong is produced in early to mid-April. Other black teas are produced during this time period, too, such as Golden Monkey, and Yixing Congou. Pluckings for some pu-erhs are also done in Yunnan Province starting in April and continuing through July. A special version called “Yunnan Spring Buds” is quite prized by those who can get it. One thing is for sure: the pre-Qingming teas go fast, often being ordered before the plants have even awakened from dormancy. The coming of Qing Ming, though, does not signal the beginning of the end but rather the beginning of the next harvest round. If you haven’t pre-ordered from us, it’s not too late. The harvest looks to be a good one and should produce some teas of exceptional quality. This entry was posted in Holidays and tagged chinese tea, JAS-eTea, qing ming. Bookmark the permalink.